A graphene-based electrical nano-device has been developed which could considerably enhance the energy efficiency of vehicles powered by fossil fuels. The nano-device, referred to as a 'ballistic rectifier', is capable of converting heat into a usable electrical current, which would otherwise be wasted from the engine body and car exhaust.Car parts exhaust can go up to temperatures of 600°C. The recovered energy can then be stored in the vehicle battery or be used to power other automotive components such as power steering and air conditioning.A team of researchers at The University of Manchester and a team at Shandong University have constructed the nano-rectifier. The Manchester team was headed by Professor Aimin Song and Dr. Ernie Hill. The device uses the extremely high electron mobility of graphene, a property which establishes the rate of transport of an electron in a material and the operating speed of electronic devices. The ensuing device is a very sensitive room-temperature rectifier that was ever built. Traditional devices with comparable conversion properties need cryogenically low temperatures. Even today’s very efficient internal combustion engines can only convert approximately 70% of energy burned from fossil fuels into the energy needed to power a car. The rest of the energy generated is frequently wasted via cooling systems or exhaust heat. Greg Auton, who conducted a major portion of the experiment said: “Graphene has exceptional properties; it possesses the longest carrier mean free path of any electronic material at room temperature. Despite this, even the most promising applications to commercialize graphene in the electronics industry do not take advantage of this property. Instead they often try to tackle the problem that graphene has no band gap. Professor Song who invented the concept of the ballistic rectifier stated: “The working principle of the ballistic rectifier means that it does not require any band gap. Meanwhile, it has a single-layered planar device structure which is perfect to take the advantage of the high electron-mobility to achieve an extremely high operating speed. Unlike conventional rectifiers or diodes, the ballistic rectifier does not have any threshold voltage either, making it perfect for energy harvest as well as microwave and infrared detection. Graphene was the first 2D material in the world. It was isolated in 2004 at The University of Manchester. Subsequently a whole range of new 2D materials have been discovered. 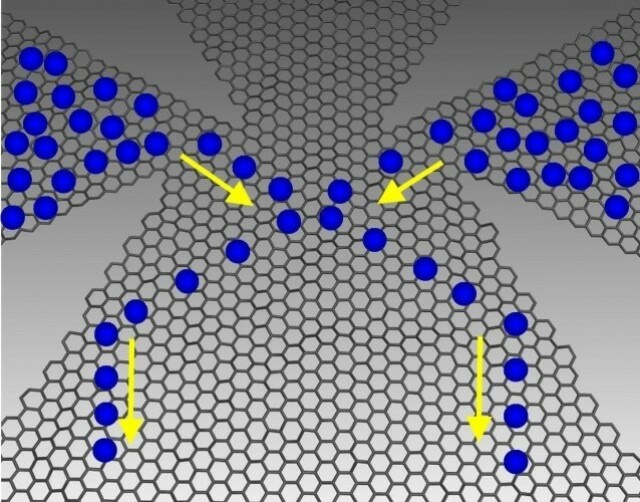 The benefit of a graphene-based nano-rectifier is its excellent conversion efficiency at room temperature from an alternating current to a direct current. This is possible by the very high electron mobility demonstrated in this research. Going forward, the Manchester team plans to scale up the research by using large wafer-sized graphene and carry out high-frequency experiments. The resulting technology can also be employed for recovering wasted heat energy from power plants.